Illinois' health insurance marketplace is working to sign up Hispanics. About 29 percent of Latinos in the U.S. are uninsured. 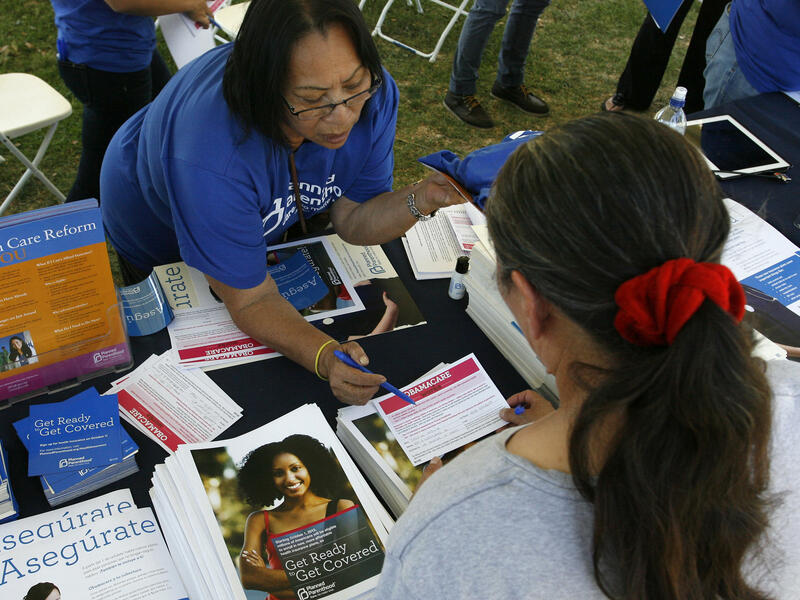 Planned Parenthood worker Alicia Gonzales promotes the Affordable Care Act during an outreach event for the Latino community in Los Angeles in September. All throughout the country, supporters of the Affordable Care Act have worked to reach the uninsured, holding health fairs and putting ads on TV and radio. The push continues to get as many enrolled as possible, especially Latinos — the most uninsured group in the country. Illinois has taken its show on the road with its Road 2 Coverage statewide mobile tour. In Chicago, Jose Munoz points to Road 2 Coverage's huge RV plastered with the Illinois marketplace slogan — "Get Covered Illinois" — parked outside the field house at Humboldt Park. The neighborhood is home to many Latinos. "What we are doing is going statewide with this RV, meeting people in the community, telling them about Get Covered Illinois," Munoz says. Inside the field house, a big crowd listens intently as officials explain the ins and outs of the Affordable Care Act. About 29 percent of Latinos in the U.S. are uninsured, and more than 10 million — citizens and legal residents — are eligible for insurance under Obamacare. During this session, navigators are on hand to help people enroll. "I think this is one of the best things the Obama administration has done," says Marixa Vidal, who signed up earlier. "I myself thank the Obama administration, because I am a cancer survivor and insurance would not take me — even where I work — would not take me because of my pre-existing condition." There are lots of Latinos who agree with Vidal, but Mark Hugo Lopez with the Pew Research Center says a recent poll shows just as many don't. "Forty-seven percent said that they approved of the Affordable Care Act, but 47 percent said they disapproved," Lopez says. "What's interesting about this is that this is a change from September of 2013, when 61 percent of Latinos approved of the law." Other polls show declines, too, although not as deep. Some Latino advocates say many still have questions about how to sign up, and there's been too much emphasis on technology, as opposed to person-to-person contact. That personal approach is the idea at the networking party for the Little Village Chamber of Commerce, which represents a business and mostly Mexican-American residential area in Chicago's West Side. Although there's plenty of support for Obamacare among those attending, accountant Jeorge Barajas says there's a reason why it may be waning among Latinos. "I think it's a lot of the negative media that Obamacare has gotten," Barajas says. "Some of it has been deserved because of the initial problems they had with the website, but at the same token, a lot of it is just a political attack on Obama." There's been no law more polarizing than the Affordable Care Act during the Obama presidency. House Republicans have voted to repeal all or part of it more than 50 times, and while that might not sit too well with Latinos who predominantly vote Democratic, Carlos Pena says there's more to it than botched websites and negative attacks. "The decline in support is something that's not only related to Obamacare itself, but also to immigration law and the recent deportation, the excessive deportation," says Pena, who works for a local small business lender. Undocumented immigrants aren't eligible for insurance under the Affordable Care Act, but Obama's deportation of nearly 2 million of them during his presidency may have soured many Latinos' opinion of him. Earlier this month, the president spoke during a town hall meeting partially sponsored by the Telemundo and Univision networks. Obama said he can't ignore laws on the books, but supports comprehensive immigration reform and needs Congress to act. He also had a message for people leery about enrolling if they have family members who are not legal residents. "For everybody out there who is in a mixed family, there is no sharing of the data from the health care plan into immigration services," he said. "You should feel confident that if somebody in your family is eligible, you should sign them up." Mayra Alvarez, head of the federal government's Office of Minority Health, says despite the president's assurance, she expects nay-sayers will continue to push back against enrollment efforts. "I think the most convincing argument is seeing other families that might be in similar situations having gone through this process and ended up on the other end with quality, affordable health insurance," Alvarez says. It's an argument that Alvarez hopes will turn around any decline in Latino support for Obamacare. Meanwhile, anyone who started the process of enrolling but won't be finished by Monday's deadline will get a reprieve. Under a grace period announced by the White House, they'll have at least until mid-April to finish the paperwork. So, Monday's the deadline, the final, final deadline to sign up for health coverage under the Affordable Care Act for this year. All weekend, advocates are working to enroll people, and these efforts are especially focused on Latinos who are the most uninsured group of Americans in the country. Even President Obama's gone on a last-minute media blitz in an effort to persuade Hispanics to sign up. However, Latinos seem to be split in their support of Obamacare. NPR's Cheryl Corley reports. CHERYL CORLEY, BYLINE: All throughout the country, supporters of the Affordable Care Act have worked to reach the uninsured, holding health fairs, putting ad on TV and radio. Illinois has also taken its show on the road. JOSE MUNOZ: This RV is part of our Road 2 Coverage tour. 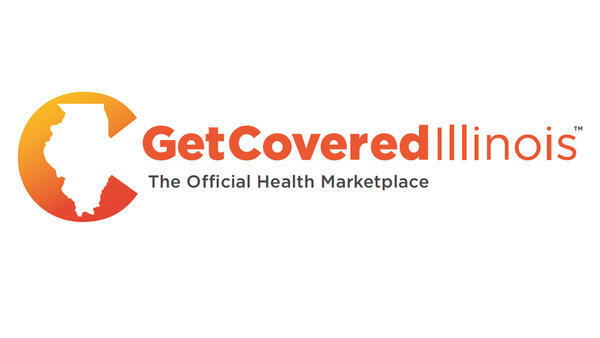 CORLEY: Jose Munoz points to a huge RV plastered with the Illinois marketplace slogan, "Get covered Illinois," and parked outside the field house at Chicago's Humboldt Park. The neighborhood is home to many Latinos. MUNOZ: We're going statewide with this RV, meeting people in the community, telling them about Get Covered Illinois. CORLEY: Inside the field house, there's a big crowd and people listening intently as officials explain the ins and outs of the Affordable Care Act. About 29 percent of the Latinos in the U.S. are uninsured and more than 10 million citizens and legal residents are eligible for insurance under Obamacare. During this session, navigators are on hand to help people enroll. Maritza Vidal signed up earlier. MARITZA VIDAL: I think this is one of the best thing that the Obama administration has done. I, myself, thank the Obama administration because I am a cancer survivor and insurance would not take me, even where I work, because it's a preexisting condition. CORLEY: There are lots of Latinos who'd agree with Vidal, but Mark Hugo Lopez with the Pew Research Center says a recent poll shows just as many don't. MARK HUGO LOPEZ: Forty-seven percent say that they approved of the Affordable Care Act, but 47 percent said they disapproved. What's interesting about this is is this is a change from September of 2013, when 61 percent of Latinos then approved of the law. CORLEY: A big shift. Other polls show declines too, just not as deep. Some Latino advocates say a lot of people still have questions about how to sign up and there's been too much emphasis on technology instead of person-to-person contact. That personal approach is the idea at the networking party for the Little Village Chamber of Commerce in Chicago. Carlos Pena says there's more to it than botched websites and negative attacks. CARLOS PENA: The declining support is something that's not only related to Obamacare itself, but also to immigration law, and the recent deportation, the excessive deportation. CORLEY: Undocumented immigrants aren't eligible for insurance under the Affordable Care Act, but President Obama's deportation of nearly two million of them during his presidency may have soured many Latinos' opinion of him. Earlier this month, the president spoke during a town hall, partially sponsored by the Telemundo and Univision networks. Obama said he can't ignore laws on the books but supports comprehensive immigration reform and needs Congress to act. He also had a message for people leery of enrolling if they have family members who aren't legal residents. PRESIDENT BARACK OBAMA: For everybody out there who's in a mixed family, there is no sharing of the data from the health care plan into immigration services. You should feel confident that if somebody in your family is eligible, you should sign them up. CORLEY: Myra Alvarez, the head of the federal government's Office of Minority Health, says despite the president's assurance, she expects naysayers will continue to push back against enrollment efforts. MYRA ALVAREZ: I think the most convincing argument is seeing other families that might be in similar situations having gone through this process and ended up on the other end with quality affordable health insurance. CORLEY: It's an argument that Alvarez hopes will turn around any decline in Latino support for Obamacare. Meanwhile, anyone who started the process of enrolling but won't be able to finish by Monday's deadline will get a reprieve. Under a grace period announced by the White House, they'll have at least until mid-April to finish the paperwork. Cheryl Corley, NPR News, Chicago. SIMON: You're listening to WEEKEND EDITION from NPR News. Transcript provided by NPR, Copyright NPR.